UPDATE 2PM: A COLLINSVILLE man has died after his ute collided with a truck head-on in Glenden on Thursday morning. Police were called to the scene on Collinsville Elphinstone Rd, 5km outside of Glenden, about 8.15am. The wide load was carrying an empty water truck southbound on Newlands Access Road while the utility was travelling north towards Collinsville, when the two collided. The driver of the utility, a 34-year-old Collinsville man, died at the scene. The driver of the wide load was not physically injured during the incident. The Forensic Crash Unit is investigating and urge anyone who may have witnessed the crash or who may have relevant dashcam to contact police. UPDATE 1.30PM: A MAN has died after a ute and truck smash in Glenden this morning, police have confirmed. Police are expected to release further details soon. Collinsville Elphinstone Road remains closed in both directions as investigations into the crash continue. UPDATE 10.30AM: FORENSIC crash investigators are at the scene of a serious accident at Glenden. A Queensland Police spokeswoman confirmed Collinsville Elphinstone Road is closed in both directions as investigations continue at the scene of the crash. She said a wide load collided with a 4WD ute about 8am, resulting in critical injuries to one person. UPDATE 10AM: MULTIPLE emergency crews remain on scene at a serious traffic crash at Glenden. A Queensland Fire and Emergency Services spokeswoman said two fire trucks were still at the scene, assisting police and ambulance crews. She said SES crews had also been called in to help with traffic diversions, as Collinsville Elphinstone Road would be closed for some time. A Qeuensland Ambulance spokesman said two people were assessed, one with critical injuries and one with no apparent injuries. He said no one was transported to hospital. 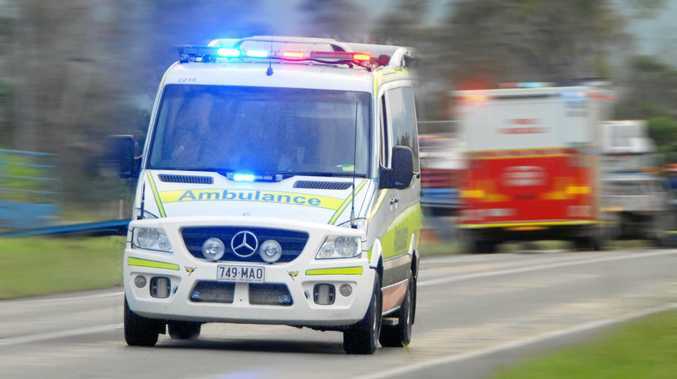 INITIAL: A PERSON has suffered critical injuries after a truck and ute collided in Glenden on Thursday morning. Emergency services were called to Collinsville Elphinstone Rd near the intersection with Ewan Drive about 8.08am. A Queensland Ambulance spokesman said one patient is being treated on scene for unknown injuries and the driver with critical injuries, understood to be the driver of the ute, will not be taken to hospital. Firefighters are on scene to make it safe. Queensland Police have shut the road in both directions.